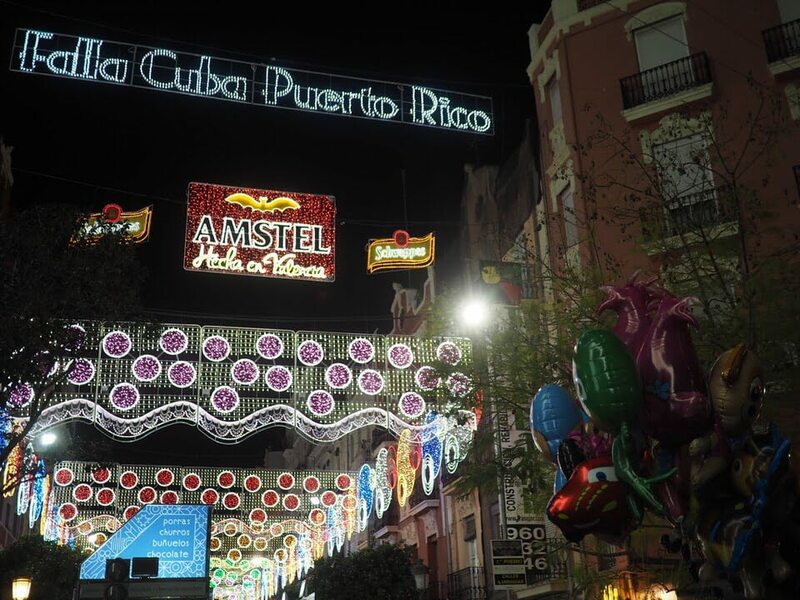 Last year I went to Las Fallas in Valencia. I’d been wanting to go for years. It’s that festival in Spain where they set fire to everything – well, on the last day anyway. The build up is filled with parties, special food, fireworks and some kind of confusing traditions. I hadn’t done any research on Las Fallas before I went and didn’t really know what to expect. Lucky for me I had a Valencian friend, Raquel, enlighten me on some of the complex customs and ceremonies. So apparently it’s not just about setting fire to everything in sight. 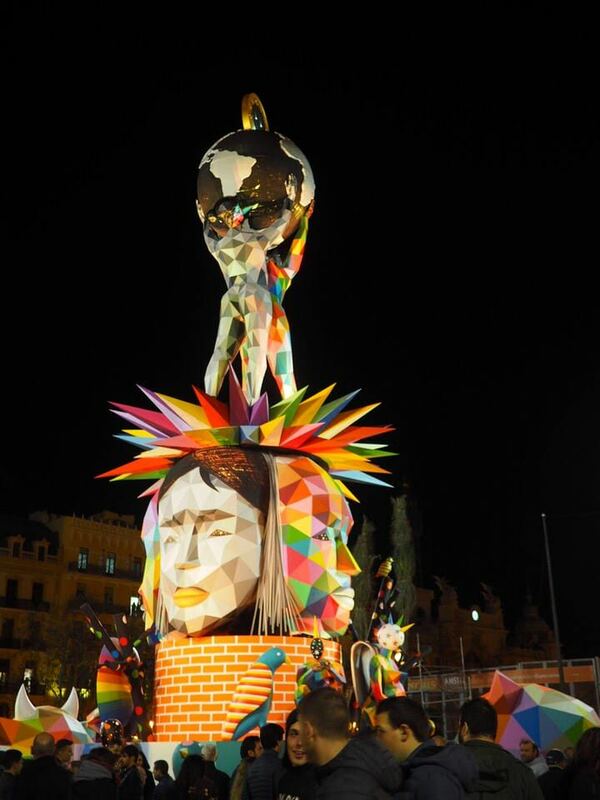 I was genuinely amazed by Las Fallas – mainly because I couldn’t believe they’d spend all year and so much money creating these incredible statues, only to burn them down in blazing glory. Also, the fireworks, firecrackers and kids setting them off wherever they pleased were not good for my nerves. So, what is Las Fallas? 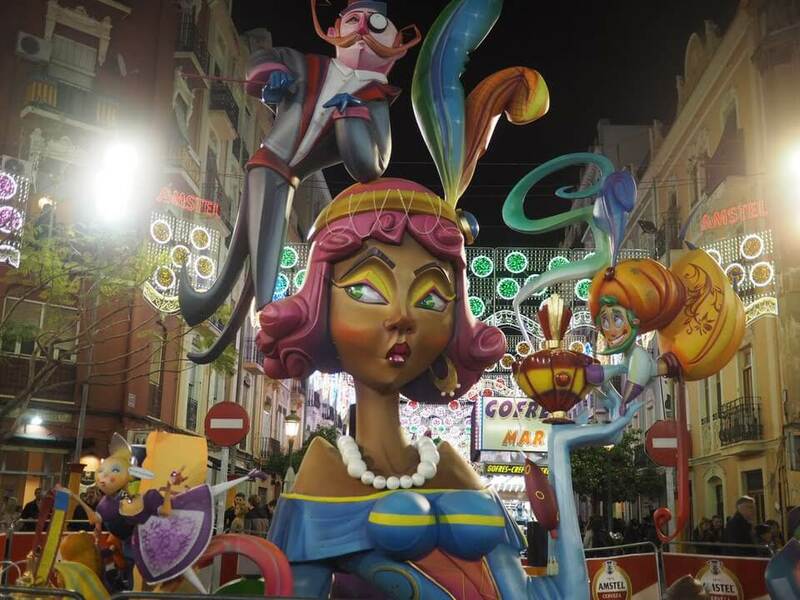 Las Fallas is a cultural celebration located in the south east of Spain, in Valencia. 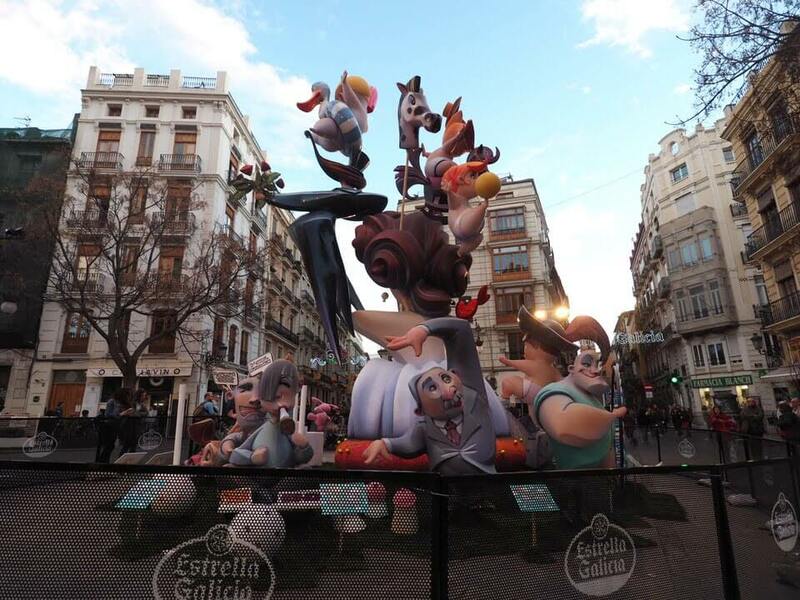 Although officially taking place from the 15th to 19th of March, for Valencians Las Fallas is a month-long event all about saying goodbye chilly weather and hello spring. The city is transformed into a party playground with fireworks, music and copious amounts of on street drinking (the only time it’s legal to do). 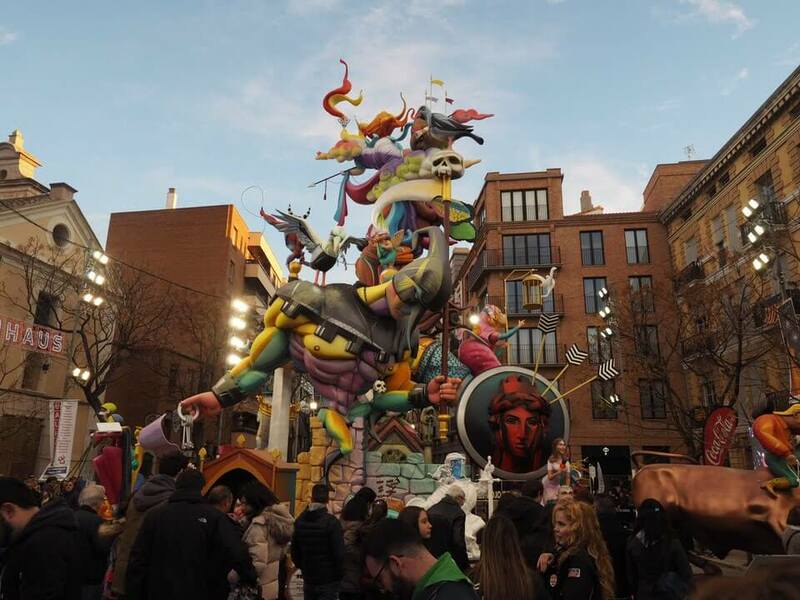 Las Fallas also honours Saint José, the patron saint of carpentry and is such a notorious event that it’s been listed as a UNESCO Intangible Cultural Heritage of Humanity. What do you actually do there? 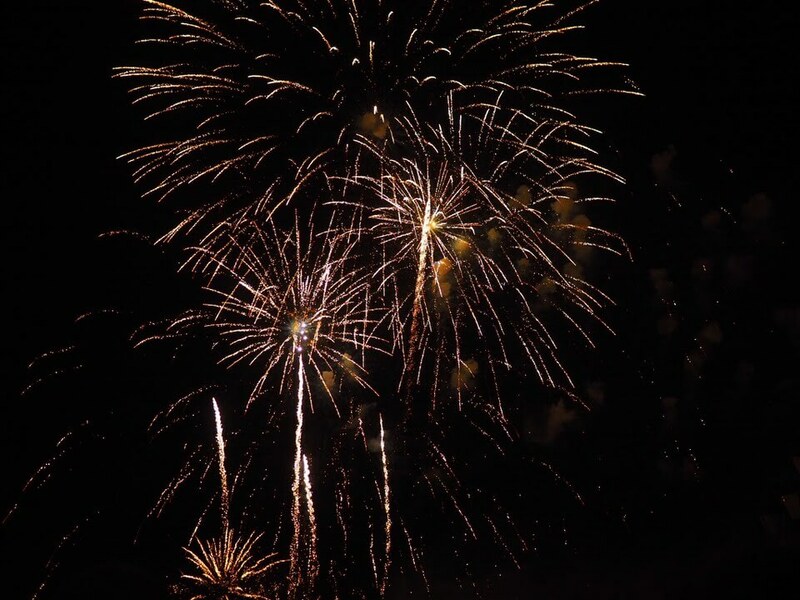 Expect music, parades and fireworks – lots of fireworks. They let them off daily at 2pm in the Town Hall Square in what’s called La Mascleta all month until the 19th of March. It might seem a little strange to let them off when it’s still light, but on this occasion it’s all about creating as much noise as possible so everyone can hear them wherever they are. You need to get to the Town Hall Square early for this. It gets very busy, and hectic. Aim for an hour to 90 minutes before it starts. And ohmygod, it is LOUD. My heart was pounding and I’m not entirely sure if I enjoyed it or not, but we were right near the action. I actually had to put my fingers in ears, like all the other tourists around em. Thousands of pounds of fireworks set off in just a few minutes in broad daylight – why not hey? But daily fireworks is not enough for the Valencians. The city amps it up to a twice daily display between the 15th and 19th March by adding in an extra night time edition by Turía Gardens. With that one you can actually see the great colours and enjoy watching from different city view points. As if that wasn’t enough pyrotechnics, helping you start your day the fallas way, not-so-loveable locals gather at 8am to throw firecrackers under people’s windows. 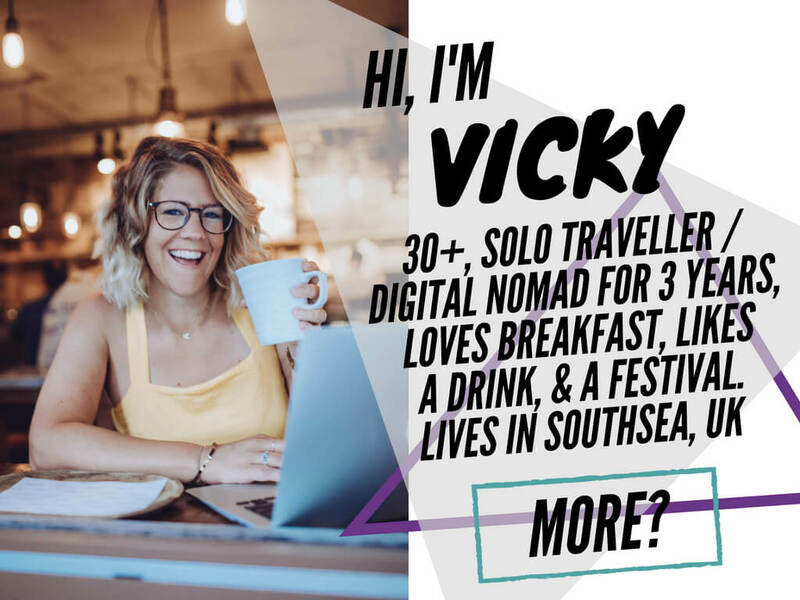 Maybe ask accommodation before booking if you’re likely to be in one of the targeted locations. You can just be walking down the street minding your own business and some fun loving kids will set off a firecracker next to you. I was an easy target and would scream pretty much every time. Then there’s the actual Fallas to see. These are huge, kind of creepy cartoon figures crafted by local neighbourhoods each year depending on the theme. And don’t be thinking this is some slapdash papier-mache affair. The different neighbourhood associations go all out to create two of these massive wooden puppets to parade around the city and think carefully about who they want to depict, often it’s a satirical character based on the previous year’s events. The deadline for having the Fallas characters finished is the 16th of March, so some locals will have been working nose to the grindstone to get things done. Each falla also has a ninot, which is a small wooden doll that explains the story of the falla. Leading up to the festival through February and into March, you can see all 700 of these at the Exposicion del Ninots at the City of Arts and Sciences. If you see one you like, give it a vote and it may be lucky enough to be saved from the brutal burning on the last night (more to come on that later). People also spend much of the festival dressed for the occasion. Locals embrace the days of olde with traditional dress transforming into falleras and falleros. That means braided hear, puffy skirts, a lot of lace and jangly jewels for the women and headscarves, harems and waistcoats for the men. If you fancy trying out fallas fashion, there are plenty of shops in the city selling the items you’ll need to fit right in. TBH I wore jeans, jumper and a coat for most of the time. It was cold for March in 2018 and seeing as once you’re out, you’re out, I wanted to make sure I was warm enough to last the night. 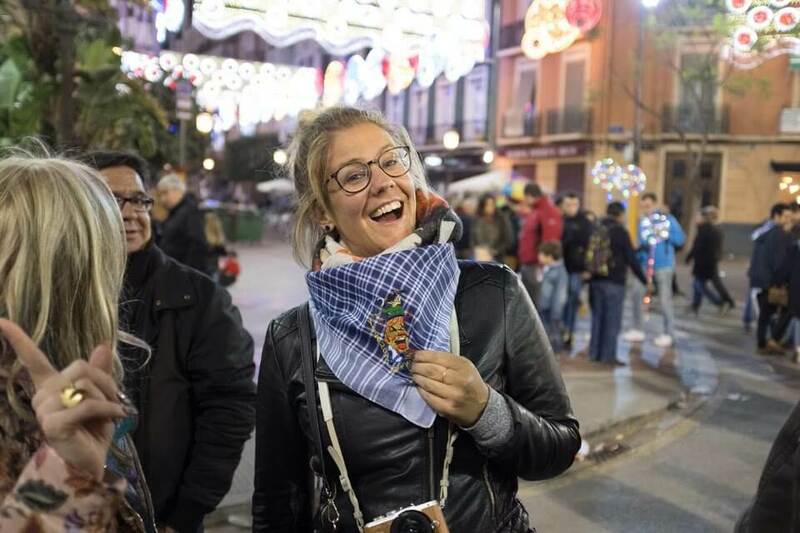 I did have this rather fetching Las Fallas neckscarf bought for me, as a souvenir. I’m totally wearing it round the wrong way, as I realised later. What events are there at Las Fallas? 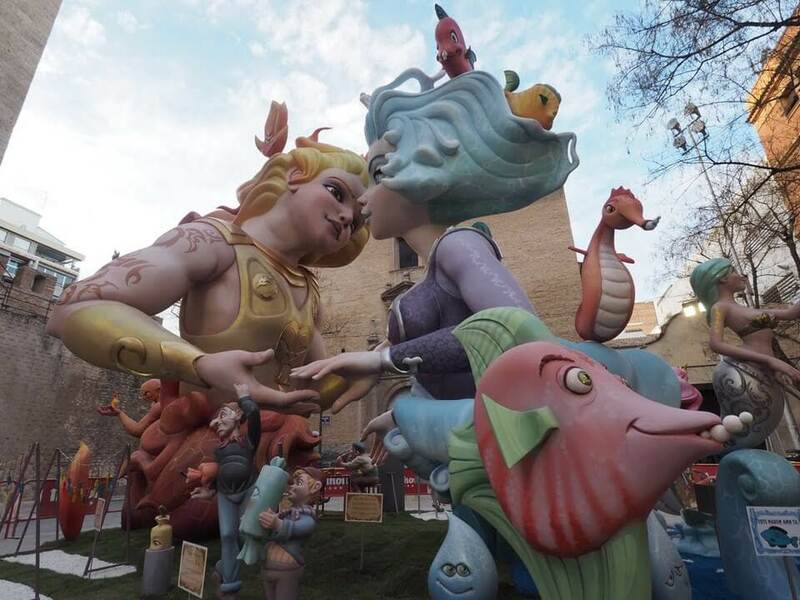 Well if you’re wandering around Valencia any time during the festival you’ll no doubt see a few of the fallas, but to get an up close view of all 300 plus, visit Plaza del Ayuntamiento on the morning of the 17th March where they’ll all be gathered for judging time. On March 17th and 18th, park yourself up by Plaza de la Virgen. This is when you’ll catch the processions of Las Fallas from 4pm onwards as well as L’Ofrena de Flors. 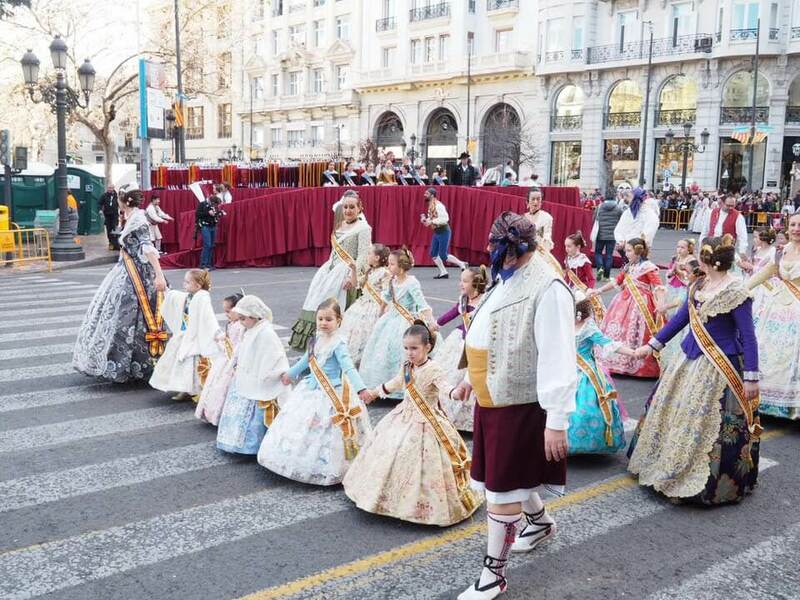 This is another parade where local women and girls in traditional dress offer up bouquets of flowers to Our Lady of the Forsaken, the Patron Saint of Valencia (a tall Virgin Mary statue). Once they’re all laid out, they form an amazing floral tapestry 15 metres high on the front of the Basilica (photo op!). And again you’ll no doubt get your fill of fireworks whether you want to or not with La Nit del Foc. This is the biggest and best display of fireworks and takes place on the morning of the 19th at 1.30am. On the final night of Las Fallas, the 19th, the locals’ hard work goes up in flames literally at La Crema. This event starts at 10pm where firstly those fallas the children have made are burned to smithereens (brutal!). Then just before midnight the others are also added to the bonfire except for one last favourite falla, judged the best in the contest, which is spared for another hour before it also turns to dust at Plaza del Ayuntamiento. This ceremony dates back to Pagan times when people would burn anything they didn’t need – an extreme spring clean. To make it all the more dramatic at Las Fallas, brass bands play a couple of sad tunes marking the end of the fest. A big part of Las Fallas is the food and during this time you’ll find loads of pop up street stalls that don’t appear at any other time of year. Of course being in Spain tapas is always a win and the locals bring out the best of it along with other traditional dishes like paella and chorizo to the streets for passersby to enjoy. 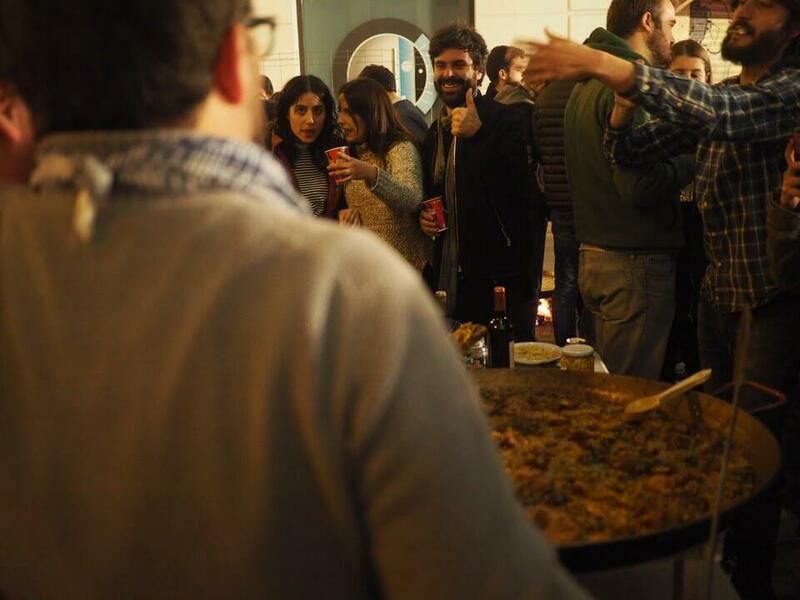 If you’re lucky, you might also catch one of the many unofficial paella cooking contests taking place in the various barrios. 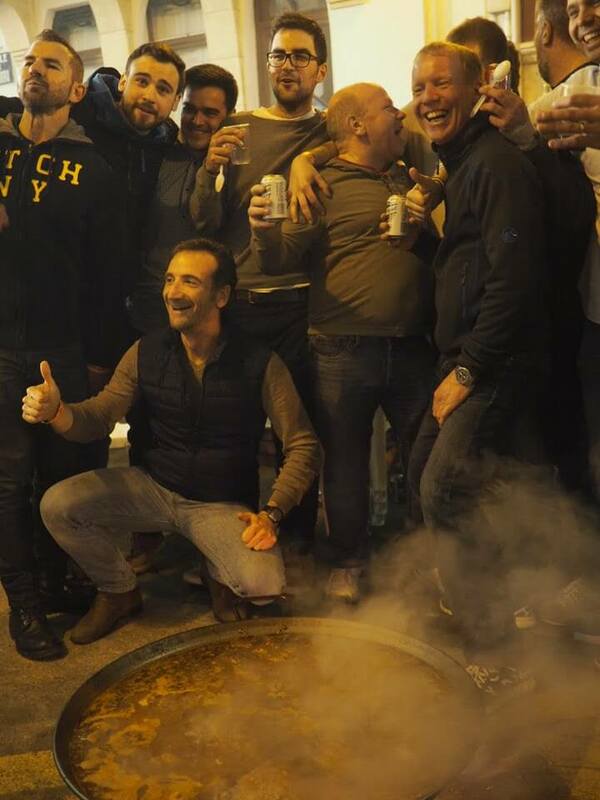 They tend to happen early on in March rather than during the official festival days and mark the fact that the famous dish was created here in Valencia. If you don’t think you’re quite up to entering, perhaps take a cooking class so you can at least go home and impress your friends. I managed to see quite a few of these around, but didn’t actually find a way in. They’re kind of cordoned off by gates to stop tourists scrounging off the locals! The real fallas favourites though are the sweet treats. Multiple flavours of churros, chocolate covered apples and Arabic sweets to try, but the ultimate treat is the traditional Valencian dessert of pumpkin buñuelos, aka more fried dough. 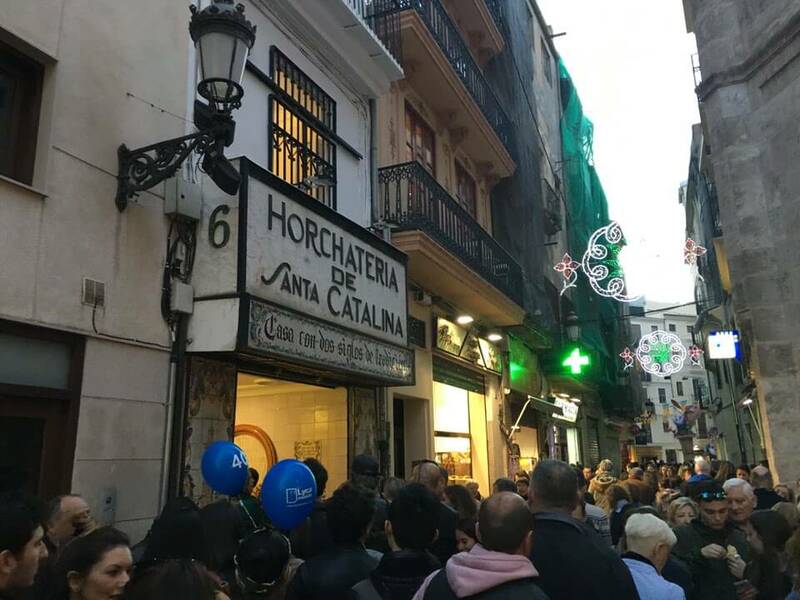 Around this time of year, the soft and sugary balls come out in full force in Valencia and you’ll find them on almost every street corner but Horchatería Fabian and Horchatería Santa Catalina are known to serve some of the best (expect queues, we gave up). Wash it all down with a glass of mistela. This local wine is supposed to help digestion, but if you’d prefer to pace yourself and go non-alcoholic try horchata. Made from almonds, it’s a traditional beverage sold in horchaterias dotted around the city. Horchatería Daniel, however is the most well-known. So that’s the basics of how Las Fallas works, but how to survive it and have a good time? 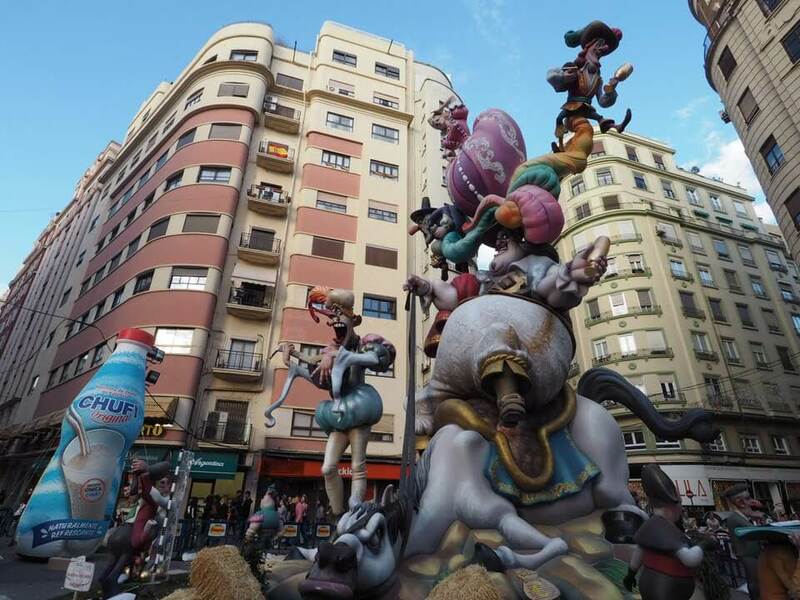 Here are my top tips for Las Fallas, and getting the most from the festival. It’s an obvious one, but with being such a big event, this small city soon fills up and no shocker, prices rocket. 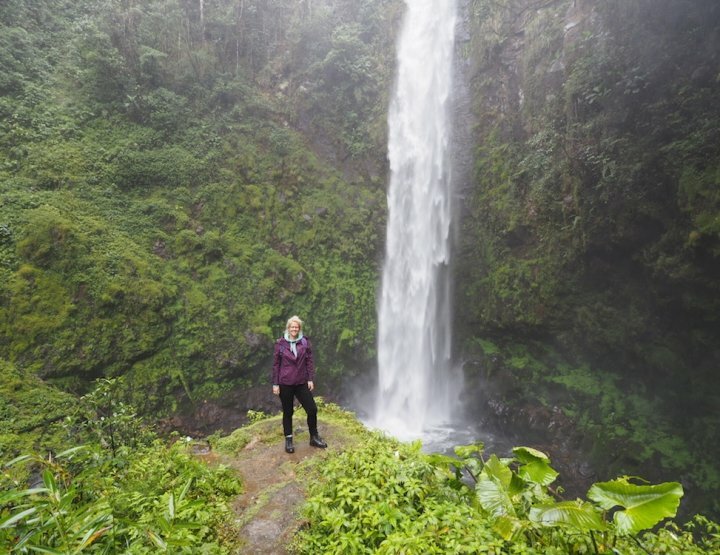 If you already know you want to go next year, I’d say get snapping up a decent spot now so you don’t end up paying over the odds for a pricey hotel you’ll spend little to no time in. I spent around £40 a night on a hostel bed in a 4-bed dorm for the festival and it was the cheapest I could find. Take a look at Booking.com for the best prices for accommodation for Valencia during Las Fallas Festival. 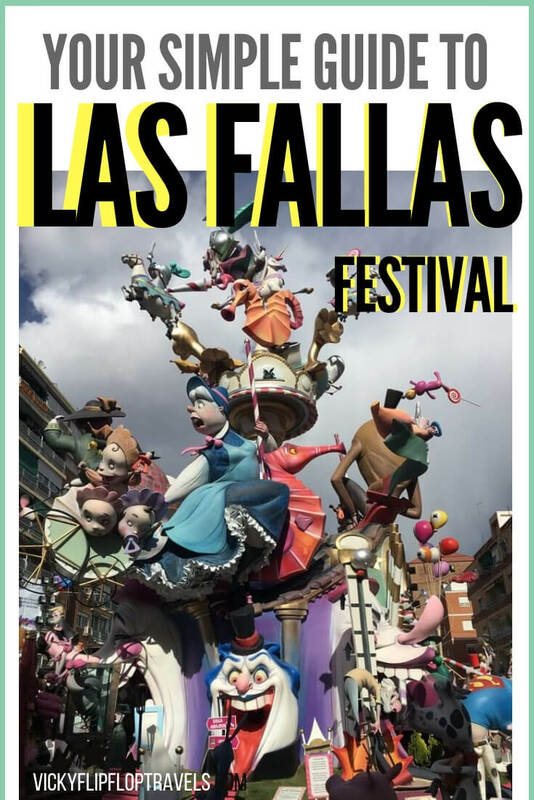 Might sound weird to do a walking tour at a festival but Las Fallas guided walking tour is a great idea to help you get your bearings. 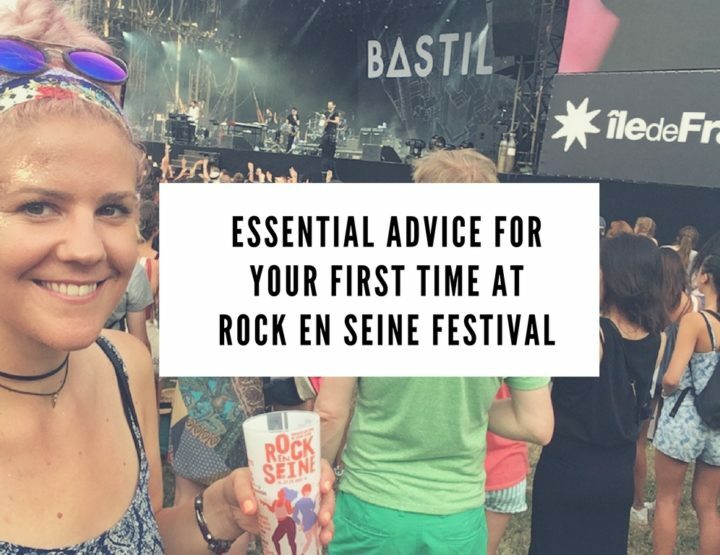 You can learn the layout of the city, and where all the important festival spots are so you’re not rushing around later. The tour also lets you see the city so you actually leave feeling like you’ve seen a bit of Valencia as well as Las Fallas, and will explain some of the culture and history behind the event. Another way to make sure you’re clued in on everything Las Fallas is to visit its namesake museum in Plaza Monteolivete, just a little outside the city centre. Here you’ll learn lots and see the winning ninots that have been saved from infernos since 1934. For any of the displays or parades, it’s worth being a keen bean and setting off at least an hour in advance for Las Fallas. 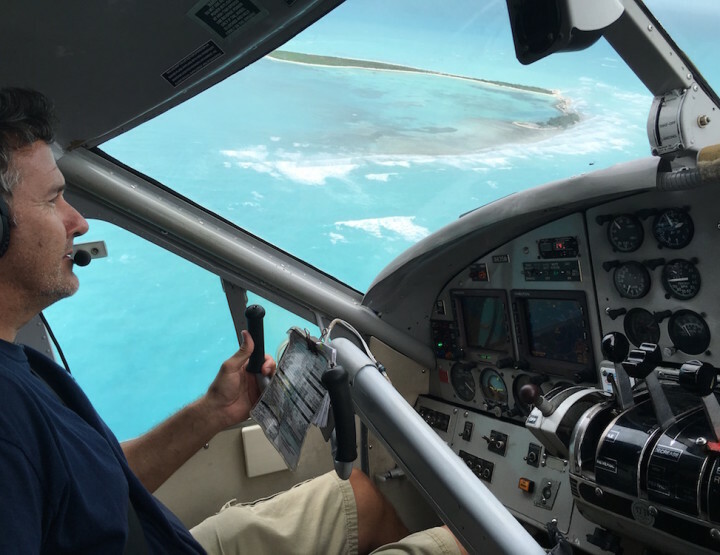 You want to give yourself enough time to get there and find a good spot, otherwise you’ll be battling crowds and straining to see what’s going on. 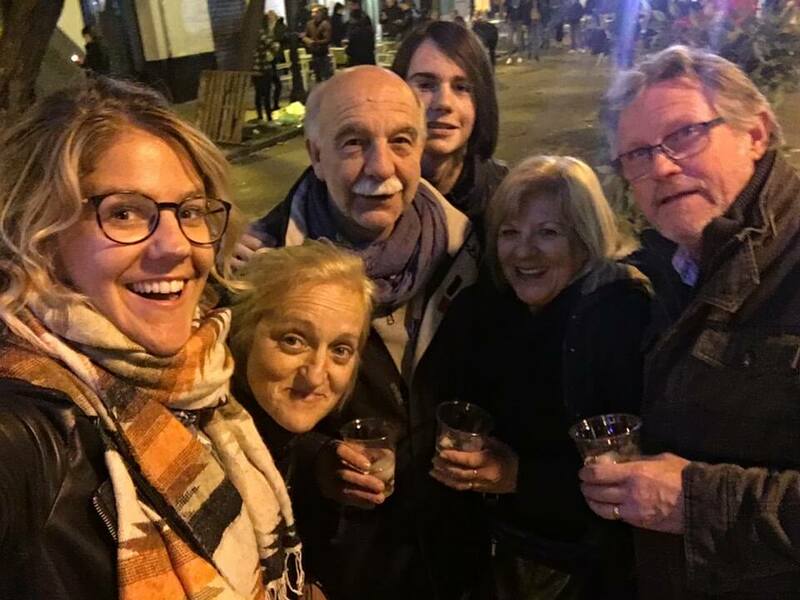 Yep, #Grandma, but Spaniards know how to party and this is arguably their biggest event all year, so even if you’re ready to hit the hay the rest of the city may not be. To ensure those precious few hours of sleep, pop in a plug to drown out the party noise. You might also want to bring these out around Las Fallas with you too because as I said up there somewhere, those Mascleta fireworks sounded loud enough to perforate your eardrums (perhaps a slight exaggeration there, slight). Most of the events at this festival are unofficial. They’re street parties or concerts thrown together by locals that you’ll easily come across by roaming the streets and following the noise. Everyone is welcome so get out walking and feel no fear in simply joining in whatever fiesta you come across. – You need to make sure you see the Masclata fireworks at some point in the Town Hall Square. 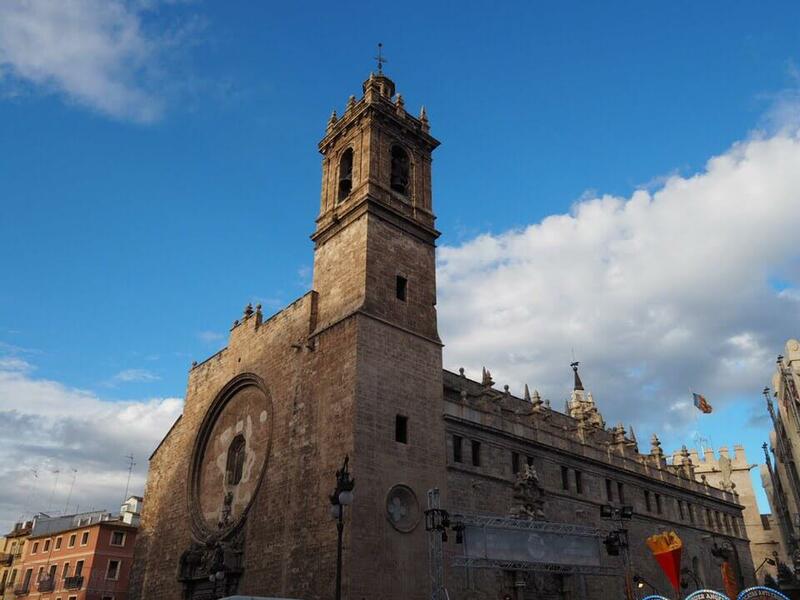 – Get a Las Fallas map and tour the city looking for the most impressive displays. – Go to the Museum of Arts and Sciences to see the displays there. – Keep your ear to the ground for late night parties. 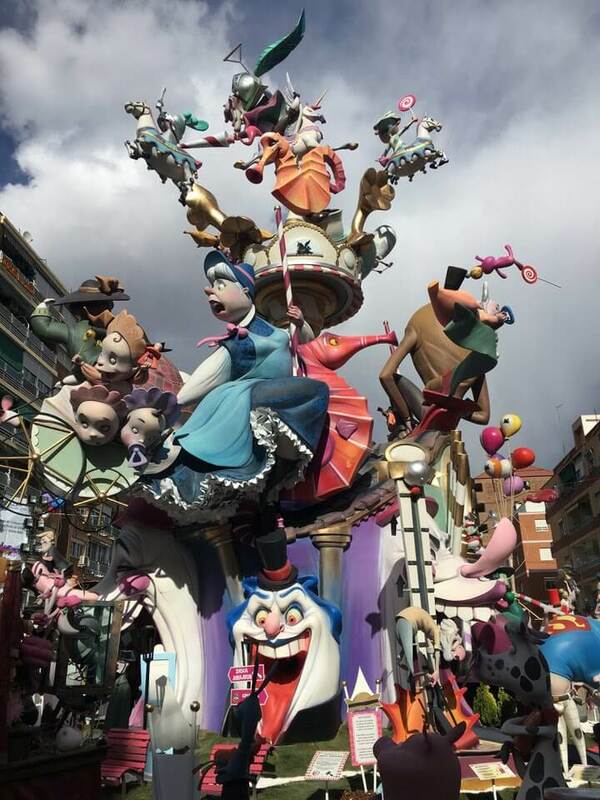 – Book your Las Fallas accommodation ASAP. 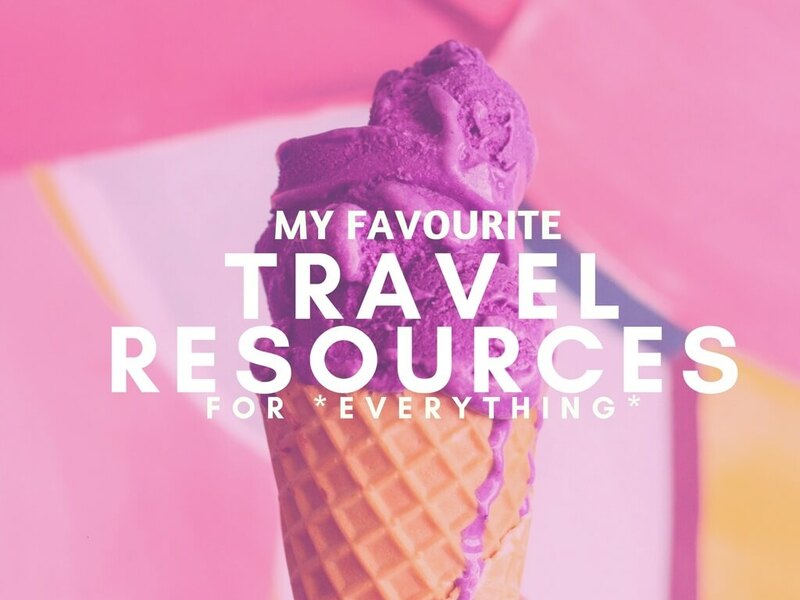 – Eat lots, drink plenty and have fun! – Oh, and make sure to buy a box of firecrackers to really get into the spirit of Las Fallas. Just one little thing, orxata is made out of "xufa", different from almonds! I just started living in Valencia for an internship i'm doing there and never had heard of Las Fallas until I came here. 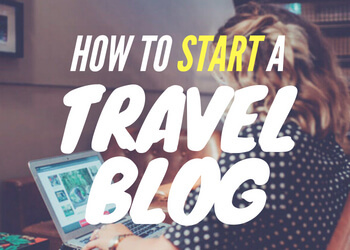 So this guide is really good one to catch up on the things that I didn't knew. Oh great news! So happy I could help. It's a fun but crazy festival!